Price - $2.52 for 2, $6.86 for 6 Pack or $21.77 for 20 Pack Cobra Panfish Jigs. The Panfish Cobra Jig gives big hook performance from a very tiny jig. Panfish Cobra's hook and hold like no other small jig. Cobra's feature a unique Mustad©, Kahle Offset Hook and all new super glow-in-dark Colors, that glow in color for 3 hours. Available in (4) sizes Including the Mighty Mouse Cobra. A must have panfish jig for the serious angler. Quote from Jeff Simpson for In-Fisherman. Quote from Mark Romanack with Fishing 411. 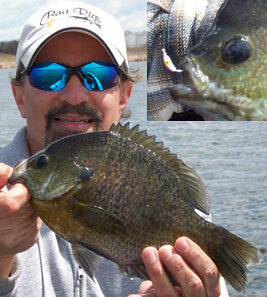 "Cold Spring tactics payoff for monster Bluegills. Think small as fish are cold and prefer smaller offerings. I use a #14 Panfish Cobra tipped with one wax worm rigged "kabob" style. This presentation is both small and compact, forcing light biting Gills to move up on the bait, resulting in better hookups." - Ice Fishing Quote "As winter drags on bluegill get tougher and tougher to catch. Patience, changing bait often, working fish you can see on the sonar and concentrating efforts early and late in the day are the best ways to ice quality fish when others have given up hope."